As Steve said – if you saw this on a hanger in John Lewis would you bother taking it into the changing room? Probably not. I played around with a few ideas – added a belt, tried it on with my new Kurt Geiger shoes but nothing seemed to me to make much of a difference. It was still boring! 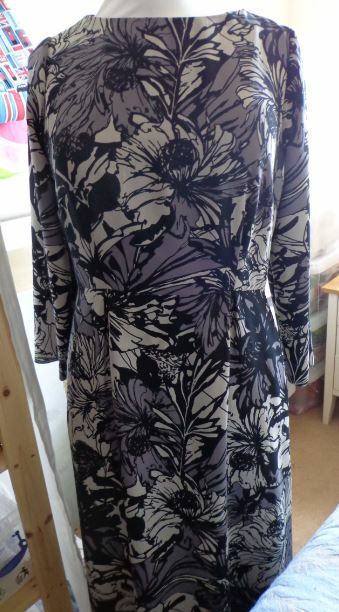 In a flash of inspiration I decided to drop the neckline and before you could say ‘Edward Scissorhand’ it was done – what a bloody stupid thing to do! My beautifully stabilised neckline became a gaping hole that looked AWFUL! It may have been boring before but now it was practically unwearable unless I covered it with a big scarf. I even managed to get 2 shoulders with different widths. 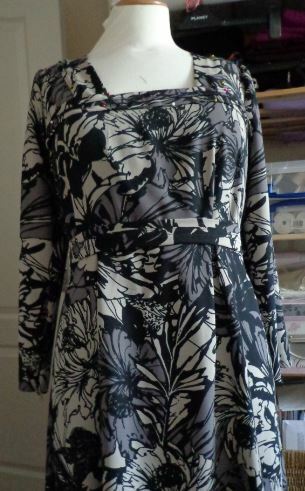 So by now I am totally fed up with this dress – I am contemplating just ripping off the top and having a skirt instead. What would you do fellow bloggers? Persevere, cut your losses and make a skirt or put it away until the Autumn for a revisit? When I have a disaster such as this I am inclined to throw my pattern and fabric stash on eBay. Is it worth treading on pins in your bare feet, trailing cotton all over the house, turning your spare bedroom into a cluttered mess, having the ironing board as a permanent fixture in your living room? Is it? Is it really? Well I have just been on the most fabulous course. I have to say in terms of value for money it is the best course I have ever been on. Michelle runs the English Couture Company in a lovely village outside Leicester. She offers a range of courses and she certainly knows her stuff. 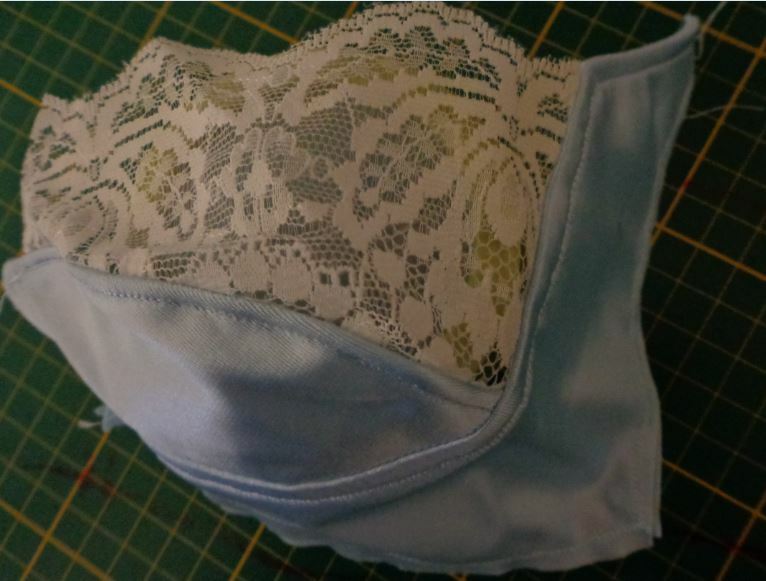 I chose the bra making weekend because I was intrigued by the techniques required to make a bra – I thought it would be horribly complicated but it wasn’t. The tricky thing is getting the right fit. The bra making weekend is 2 courses combines into a weekend – the Basic and the Advanced Bra Making. 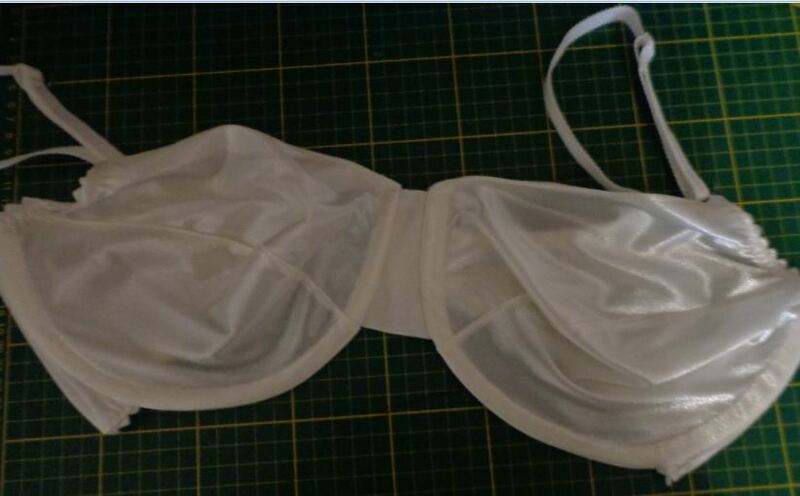 Day One was spent making a basic bra and included techniques on making the bra cup, how to apply the picot elastic, attaching the strap. When I took the bra home and tried it on I was amazed at the fit – the bra seemed too light for my 34F size but I wasn’t even aware that I had a bra on. The only issue was that the centre piece was gaping away from my chest. On Sunday we learnt how to alter the bra for fitting including adjusting the straps, raising the bra so it sits in the right place. I found that the issue with my bra was that the lower cup was too deep so needed to be shortened so that the base sat under my breasts and not on my breastbone. 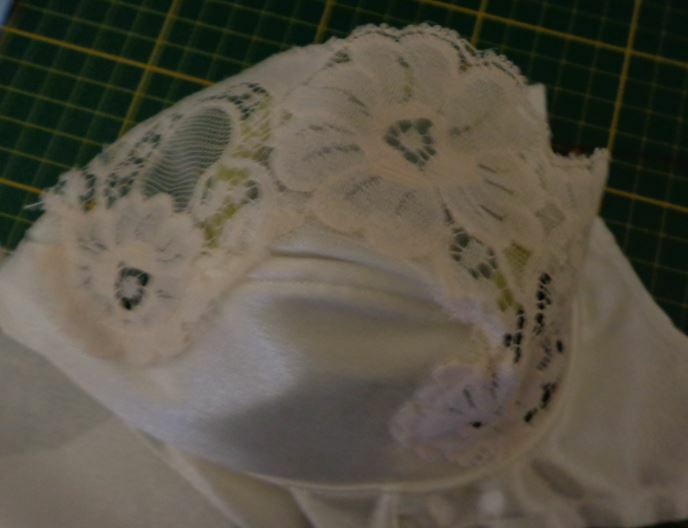 We then went on to the ‘pretties’ of bra making including how to make a padded bra as well as shaping lace. Michelle also gave each of us a bra fitting session and she will be sending out an individual pattern to fit. I can’t wait as I was also tempted by the lovely range of fabrics and lace in the shop. 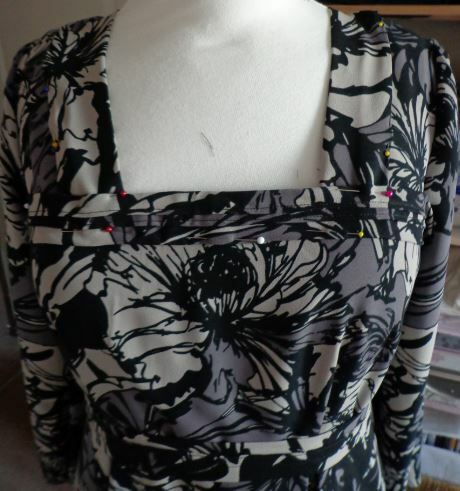 Excuse my awful top stitching but it was getting late and I was tired after 2 days sewing – I know, I know I am a lightweight! Michelle was fun and knowledgeable – even though the course was due to finish at 4 she carried on until we had done everything unlike some other courses I have been on. There were 5 of us on the course and we learnt more about the female breast and all it’s idiosyncrasies than we dreamed possible. I am so inspired by the quality of this course that I have signed up for the knickers course as you can’t have a bra without matching knickers! I can highly recommend this course if you have ever wanted to increase your skill base by learning how to make bras and more importantly bras that fit!